Great artists are often heralded for their distinctive, signature styles and Artist Neil Maccormack is no exception. His medium is a 3D canvas on which he creates visually expansive, futuristic, sci-fi worlds and fantastical moments. Maccormack brings his visually rich imagination to life with the help of LightWave 3D, which allows him to work much like a fine artist. But instead of applying paint to a canvas, he builds rich 3D images in layers—starting with a background then adding foreground layers and elements—much like an artist paints a watercolor. While the images are created on a 2D electronic canvas, their rich detail and illusion of depth is captivating. To achieve this visual sensation, his workflow synthesizes the 2D paint tools of Adobe PhotoShop with LightWave 3D modeling, lighting, and rendering. The product of his imagination finds its way into the marketplace as CG wallpaper, posters, and 3D artwork that he sells via a variety of online outlets and galleries. But a significant portion of his work is producing custom 3D still images for advertising, videogames, publishing, or other commercial clients. For commissioned work, the challenge is to understand exactly what the clients want and need before he begins. “Since this is a very detail oriented process, I’ve learned to have the client write a brief description of what they’re looking for to avoid confusion,” Maccormack said. Working from his home-based studio in Geneva, Switzerland, Maccormack is far from the 3D animation boutiques of Hollywood, New York, and London. And his facility is surprisingly minimal, just a garden-variety computer, widescreen monitor, and media storage. But this modest gear easily runs the latest, most advanced version of Lightwave 3D—version 11—and promotes a workflow that Maccormack has refined to be as smooth and streamlined as can be. 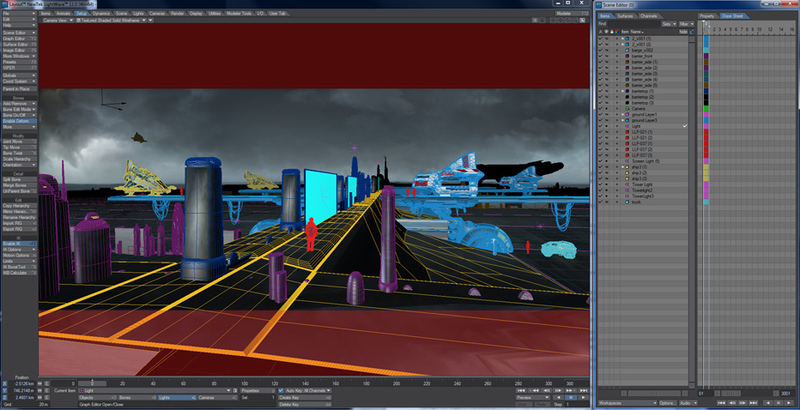 Gate 54, which is a futuristic spaceport landscape from his personal collection (see Image 1), is a good example of Maccormack’s unique, recognizable style and the way he integrates complex 2D/3D elements and layers. He provided a series of .jpg frames at incremental stages of the process to explain the techniques and workflow he typically employs. Image 1. Gate54 is a futuristic spaceport landscape from Maccormack's personal collection. Image 2 shows a background painting he completed in PhotoShop, which he then brought into LightWave to use as the 3D scene’s backdrop. “Using LightWave’s Layout module, I then created my scene based around this image. The first step was to match the camera angle, size, and position to that of the background plate by adding the image as the background in the composition tab in LightWave,” Maccormack explained. Image 2. A background painting completed in Photoshop. In Layout, he further refined the composition and camera angles and added textures, surfaces, reflections, and particle effects (like fog). Image 3 shows how he set the camera to the same resolution and matched the camera angle and placement to that of the backdrop. “Using the grid to match perspective means that any elements you add later on will also automatically be at the correct scale and position without having to move the camera,” Maccormack said. Image 3. Details the camera set up and matching it to the backdrop. To enable radiosity, he used the light source he set-up in LightWave’s image world environment. “This diffused the light so that it bounced around the scene lighting all the 3D elements the way the scene is lit,” he added. “Finally, I added a light source in the scene (Area Light) and positioned this to match the light source in the background. I tweaked the strength and color of the light until I was happy with the result.” At this point (see Image 4), having a test object in the scene enabled him to match shadow strength and light direction. Image 4. A test object in the scene enabled him to match shadow strength and light direction. He then added in his 3D elements. Many of these 3D elements—such as spacecraft, buildings, and people—were previously created from scratch in LightWave’s 3D Modeler module and brought into the scene, but a few were cloned from similar objects to save time. The only new element done at this stage was the barrier itself, which he created using relatively low-res geometry to save time. “For me, the more rewarding side of creating an image is always trying to create a mood and invoke a feeling rather than the complex modeling side or other technical elements of the project,” Maccormack said. Images 5 and 6 show the wireframe layout of the elements, exhibit the basic texturing of the elements. At this stage, Maccormack set the specular and diffuse levels, and added some basic metal images as a cubic mapping onto some of the larger elements. Images 5 and 6. Wireframe layout and basic textures of the elements. 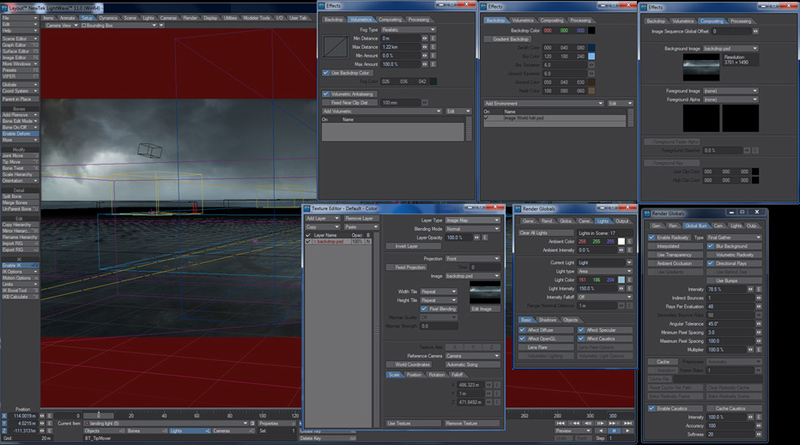 Image 7 is the final layout render. It shows how he added extra point lights into the scene to light different elements such as the screens and ships to add some additional contrast to the scene. And Image 8 shows the final image in PhotoShop with the extra layers and elements added to complete the image. Image 7. 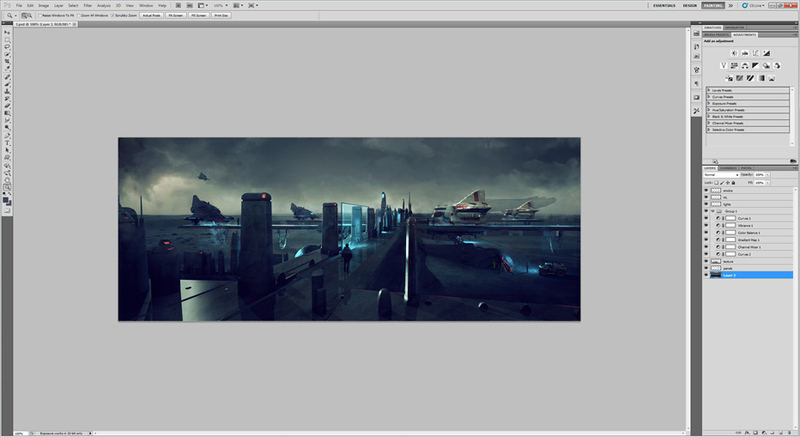 Final layout render. Image 8. The final image in PhotoShop with the extra layers and elements added to complete the image. Since rendering is a resource intensive process, Maccormack always begins with a test render of a small section of the 3D painting to ensure that its attributes are to his liking. If he wants to make any changes, such as adjusting the camera angle or tweaking the lighting, he can go back and zero in on just those specific changes without re-doing the whole section or project. The ability to maintain a consistent look to visual elements, such as color treatments, layers, lights, and textures—as the image moves back and forth between PhotoShop and LightWave—is also especially advantageous. When he’s happy with everything in the scene, he then renders the entire image in a very high resolution. As a final step, the composite typically goes back into PhotoShop for finishing touches to give the entire piece a cohesive, polished look.